Chicana borderlands theorist Gloria Anzaldúa described the U.S.-Mexico borderlands as “una herida abierta,” an “open wound” created when two nations rub against each other and the less powerful one bleeds. In Anzaldúa’s seminal work, Borderlands/La Frontera, she spoke not only of a specific geographic place – the U.S.-Mexico border – but she conceived of the borderlands broadly, as a space that is “physically present wherever two or more cultures edge each other, where people of different races occupy the same territory, where under, lower, middle and upper classes touch, where the space between two individuals shrinks with intimacy.” Anzaldúa’s borderlands theory has inspired, and continues to inspire, many borderlands historians who are trained to see history from the edges rather than the center, to illuminate the perspectives of those who live on the periphery of nations and tell their stories. Gloria Anzaldúa’s borderlands theory deeply informs my own research, focused on two curanderos (Mexican faith healers) active in the borderlands over the turn of the twentieth century. Writing history from this perspective, I focus on the intersections of Don Pedro Jaramillo and Santa Teresa Urrea, as they sit geographically at the edges of nations in the U.S.-Mexico borderlands. These healers found themselves on the edges of dominant institutions — the church, professional medicine, and Anglo culture –– while they provided culturally resonant healing and sustenance to ethnic Mexicans, indigenous peoples, Tejanos and others in the borderlands who faced increasingly oppressive forms of state power deployed by both nations. Through their curanderismo practices, they also helped shape national ideologies as well as spiritual and medical practices by helping to create and maintain transnational ethnic Mexican communities and identities in the U.S-Mexico borderlands. In this way, my research attempts to show how the oft-marginalized stories that exist in the “open wound” of the borderlands are important to tell not only in order to offer a more complete, rich, and complex version of our national history, but also because they are integral to the on-going construction of Multicultural America. I have learned firsthand in the past year that it is not only scholarship that borderlands methodology and perspective inspires, but also teaching. Over the last three semesters, I have taught several sections of the course “Multicultural America” for Metropolitan State University of Denver. This course is a broad survey of United States history with a focus on race and ethnicity, especially on the experiences of African Americans, Latinos, Asian Americans, Native Americans, and first generation European immigrants. In other words, it offers a non-traditional view of U.S. history – a history told from the margins, from the borders of nation, institutions, and marginalized identities. Thus, the course lends itself beautifully to a borderlands perspective. “Multicultural America” is a one thousand level history course created to fulfill a multicultural requirement for students at Metropolitan State University of Denver, and so it attracts students from every major and walk of life. As I reflect on my teaching of this course over the last three semesters, I have come to see that Anzaldúa’s description of the borderlands as “physically present wherever two or more cultures edge each other, where people of different races occupy the same territory, where under, lower, middle and upper classes touch, where the space between two individuals shrinks with intimacy,” applies not only to the history I am writing and teaching, but also to the classroom. What I have experienced in my classrooms is that while I am teaching Multicultural America, the students I am teaching are Multicultural America. For example, last semester, in one of my classes a student who is a member of the Northern Cheyenne, a professional boxer who grew up between the reservation and the city, shared with the class what the Sand Creek Massacre of 1864 means to him, a gruesome event that took place not far from Denver in southeastern Colorado, when a U.S. Army-led militia attacked a peaceful village of Northern Cheyenne and Arapaho, killing and mutilating hundreds, including women and children. 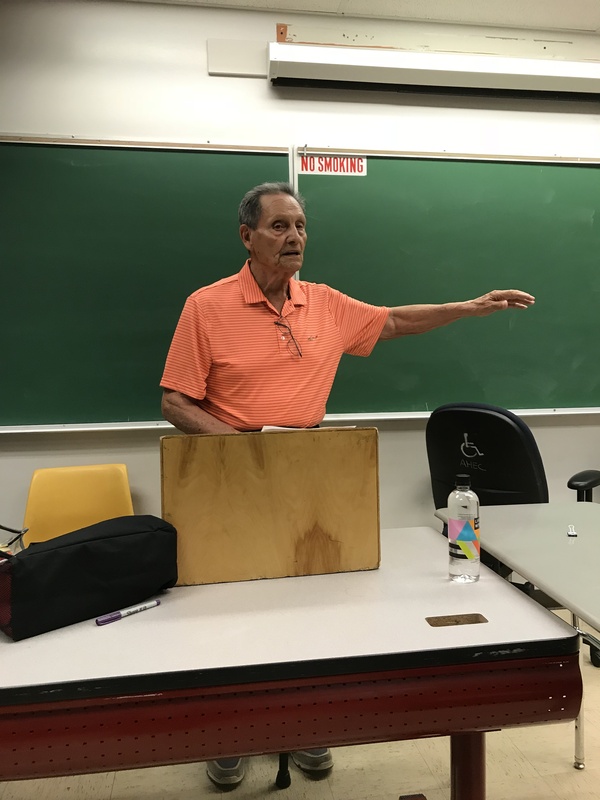 In a different section of Multicultural America, one student brought his grandfather, Ricardo Romero, a Chicano activist active since the 1960s, to speak to our class about the radicalism of the Chicano movement in Denver. Mr. Romero co-founded Crusade for Justice (with his brother-in-law Rudolfo “Corky” Gonzales), Escuela Tlatelolco, Mexican National Liberation Movement and his current non-profit Al Frente de Lucha. Mr. Romero’s admonishment to the class that “if you do not fight racism you condone it” was inspiring for many students in the class who knew of the radical Chicano movement, but not how it manifested in Denver, and also for those that were not at all familiar with El Movimiento but recognized the importance of his message for our world today. Finally, actress and immigration activist Diane Guerrero came to Metropolitan State University of Denver to speak about her book, In the Country We Love. She told her story as a daughter of undocumented parents who were deported, leaving her to grow up without them in the United States. Guerrero also spoke about her activism and advocacy for undocumented peoples in the United States. Her book was assigned reading for my Multicultural America students last semester and the writing assignment connected to reading her book was to write an essay about what the “American Dream” means to Guerrero, her family, and immigrants in America. The opportunity that students had to see her presentation – as well as some DREAMer students getting to personally meet her – produced inspired and moving “American Dream” essays revealing the power and promise of the American Dream as well as its limitations. Borderlands professor Ben Johnson introduced me to this Faulkner quote during my first year in graduate school at Southern Methodist University and it has been lodged in my subconscious ever since – I use it to introduce every class I teach. On the first day of class I ask students: What is history? Why does it matter? After some discussion where I write students responses on the blackboard, I suggest that history is alive; it is a living thing, not something that exists only in textbooks. Then, I present the Faulkner quote. I ask my students to think about what Faulkner is saying, and how that can apply to the history we are studying. Students inevitably bring up the current debates over public commemoration of historical figures, and depending on the class, debates about why commemoration and public monuments matter if we cannot change the past. I use Faulkner’s quote and the class discussion it prompts to introduce the film The Last Conquistador (2008). This documentary film addresses the controversy that took place in northern New Mexico and El Paso, Texas in the early 2000’s surrounding the building and funding of a large-scale statue of Don Juan de Oñate, the Spanish Conquistador that settled New Mexico in 1598. The film provides historical background on the founding of New Mexico detailing the journey Juan de Oñate and his group of colonizers made north from Mexico in 1598 wherein they briefly stopped at what later became El Paso, Texas and read the Requerimiento, proclaiming Spanish dominion over the “new” land and all its inhabitants then moved up the Rio Grande into Pueblo Indian land. Oñate and his crew eventually set up headquarters at Ohkay Owingeh Pueblo, renamed it “San Juan Pueblo,” declared it a Spanish town, and kicked the people out of their homes that lived there yet kept them near for their food, labor, and clothing. This was the beginning of New Mexico colony. After a year, the indigenous residents of nearby Acoma Pueblo refused to give the Spaniards the requisitions of food and clothing they demanded and killed eleven Spanish soldiers in a surprise attack. Oñate retaliated immediately nearly destroying all of Acoma Pueblo, killing some five hundred men and three hundred women and children in the process and taking perhaps eighty men and five hundred women captive. Many captives were sold into slavery and male captives over 25 years of age that were found guilty had one foot severed. The filmmakers document the reaction of indigenous peoples in New Mexico to the Oñate statue. The focal point of this reaction is the friction between the Acoma Pueblo peoples who are opposed to the statue they feel celebrates the near-genocide of their ancestors and Hispanics from New Mexico who celebrate Oñate for the Hispanic culture he brought to the Southwest. The debate that rages between these opposing groups shows just how alive and contested history is, that it is certainly not dead. What I have learned after screening and discussing The Last Conquistador is that it demonstrates the overarching point that “The past is never dead. It isn’t even past” and offers a threefold pedagogical value. The Last Conquistador also allows many students to see themselves in the American history they are learning. Teaching at an institution where over twenty percent of the students claim Hispanic heritage, it is important for them to see that the foundations of our nation are not only English or Anglo, but indigenous and Spanish. This is especially true at a time when the discourse of illegality dominates discussions at the highest office of the nation regarding our southern border and immigration. Students with Mexican heritage need to see that they and their ancestors are foundational to this nation, that the history of this nation does not begin with the Thirteen English Colonies, but first as a continent made up of many indigenous nations and then with Spanish colonization in the 16th century. Finally, this film reveals the complexity and pain of the colonial encounter. Students engage with a concrete example of Anzaldúa’s “open wound,” the process of two cultures rubbing against one another – in this case the Acoma and Spanish invaders – and the less powerful bleeding. Students see that historical pain continues for generations and the wound is opened with the production of a statue that seems to erase or silence their history. In response to the film, students are asked to imagine they are members of the El Paso City Council, and they must cast a vote: should the city move forward with the statue, or dismantle the project completely? This city council debate is something the film covers, showing the difficult decision council members made about a publicly funded piece of art meant to draw tourism to the city. Students write a short paper defending their position and then we have small group and class discussions. In passionate discourse, students have asked why certain history is silenced or erased, contemplated the value of public art to teach history, and suggested that history might be made more inclusive if more perspectives are sought in the creation of public monuments and historical texts. And it is this last point that reveals the value of a borderlands approach: it illuminates the voices of those at the margins of nation and power. Gloria Anzaldúa, Borderlands/La Frontera: The New Mestiza, second edition (San Francisco: Aunt Lute Books, 1999), 25. Jennifer Koshatka Seman, “The Politics of Curanderismo: Santa Teresa Urrea, Don Pedrito Jaramillo, and Faith Healing in the U.S.-Mexico Borderlands at the Turn of the Twentieth Century” (PhD diss., Southern Methodist University, 2015). I am currently working on turning my dissertation into a book for University Texas Press. See BHIP #6: A Conversation with Dr. Maria Montoya, published on Dec. 15, 2015 on the Borderlands History Blog, in which Lina-Maria Murillo conducts an interview with Dr. Montoya about how the borderlands perspective has influenced her scholarship and teaching. Diane Guerrero, In the Country We Love: My Family Divided (New York: St. Martin’s Griffin, 2016). Diane Guerrero advocates for Immigrant Legal Resource Center (www.ilrc.org) and Mi Familia Vota (www.mifamiliavota.org). William Faulkner, Requiem for a Nun (New York: Random House, 1951). Ben Johnson is now an Associate Professor of History at Loyola University Chicago. He is the author of Revolution in Texas: How a Forgotten Rebellion and Its Bloody Suppression Turned Mexicans into Americans (New Haven and London: Yale University Press, 2003) and the recent Escaping the Dark, Gray City: Fear and Hope in Progressive-Era Conservation (Yale University Press, 2017). John J. Valadez and Christina Ibarra, The Last Conquistador (Public Broadcasting Service, 2008). This background on Oñate and the Acoma Massacre comes from David Weber, The Spanish Frontier in North America (New Haven and London: Yale University Press, 1992), 77-87. For a complete biography on Oñate, see also Marc Simmons, The Last Conquistador: Juan de Oñate and the Settling of the Far Southwest (Norman: University of Oklahoma Press, 1991). Herbert Eugene Bolton, The Spanish Borderlands: A Chronicle of Old Florida and the Southwest (New Haven and London: Yale University Press, 1921). Ronald Takaki, A Different Mirror: A History of Multicultural America (New York, Boston, and London: Back Bay Books, Little Brown and Company, 1993). I assign two optional readings to compliment the viewing and discussion of The Last Conquistador: Parul Sehgal, “Fighting Erasure” (The New York Times Magazine, Feb. 2, 2016) and Bob Corbett, review of Michel-Rolph Trouillot, Silencing the Past: Power and the Production of History, http://www.hartford-hwp.com/archives/43a/364.html.